It took a while for Google to create this feature, and some like Alex Moss, even beat Google to it, but finally it is here: the option to share a webpage on Google Plus using the Plus One button. In the video below Timothy Jordan explains how it works. It is simple. If you click the +1 button you get an extra option: share on Google Circles. If you click that you can add a comment, choose your circle and publish it to your Circles profile. The feature also includes a snippet, which Google picks from the website. 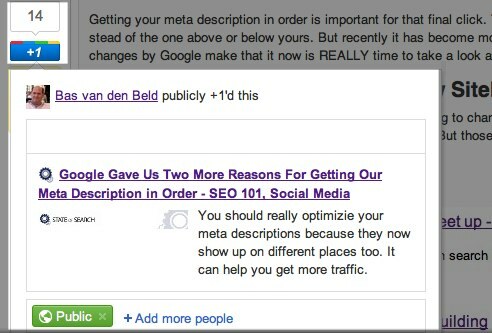 So for website owners it is important to get their snippets and meta descriptions in order, like we discussed earlier this week. If you want to add rich snippets to your page so that you will have an extensive and very nice snippet for Google to show on Circles add the schema.org attributes to your page. or use tools which are already doing this, like some WordPress plugins. Google has extensive technical documentation on this. If you try clicking on the button now you probably won’t see the option just yet. Google is rolling it out in the next few days, so you have to be patient for just a little bit. If you can’t wait you can join the Google+ Platform Preview.